Heavy frost once again this morning but luckily no snow here, smoking Sillems Councilor 1695 in a Savinelli. Just told the friends in Cologne that I'm not coming today. We got some snow overnight and there might be some tonight. Trains aren't all back on schedule yet, so I won't take the risk of getting stuck somewhere away home due to delays or cancellations. No shed time either today, with probably an inch of snow in the garden. There's going to be some thawing during the day, but it will only make things feel mote humid and thus colder. So in think I'm going to use the day to get something's done in the house, and also to prepare a Danpipe order. Time to stock up on filter crystals again, and there will be more ideas while I'm at it. Smoking from the daily jar in a 9mm filtered Bentley billiard. Good Morning, Gentlemen, and Welcome to February! It's a frigid 9°F/-12.7°C with some newly fallen overnight snow on the ground. Today will be the last of the Arctic temperatures, and then we'll be treated to six days of early Spring weather. Let the thaw begin! Today I'm going to the pool for a swim now that school is back in session after they've been closed due to the cold and dangerous windchill. The kiddies had the pool all to themselves during those days off, so it's now safe for old people to go back into the water. We even had a suspension of mail service for the last three days, too. Now smoking a bowl of HH Pure VA Flake in the 1950 Dunhill lovat and there's a fresh mug of coffee tucked under my work coat. About 1 inch of snow here but stopped now. which reminded me that I needed to tax it today - then the fun started; MOT had run out 3 weeks ago as dealer had tested it a month before I bought it, so frantic 'phone calls to book it in for Monday. Last edited by jimbo44; 02-01-2019 at 11:21. Your photos are making me jealous Jim....looks ideal weather for smoking a pipe. Well today is supposed to be the final day of the current heatwave...34c. For the next few days it's to be around 26c and get down as low as 11c so I think a BBQ is on the cards this weekend. Amphora Virginia in the Alco will start the pipe smoking day for me. Nearly finished a bowl of FVF (from 2014) in an Upshall G-grade. 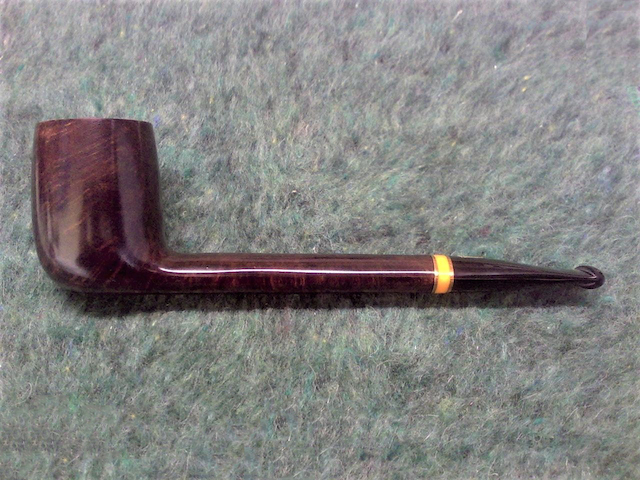 Haven't posted this pipe for yonks because it is dedicated to FVF/FVP and I have had none open for yonks. Yesterday did not go quite according to plan: I managed to stay in the house but was bombarded with inane phone calls! I did manage to reorganise my tobacco cellar - like a geologist cutting through rock strata (cellar is organised by the time of buying the tobacco) - and I cheated slightly by extracting a jar of 2014 FVF, a jar of 2014 RDF and a 2014 tin of HU Dockworker, despite the 2013 stratum still being well populated. Of course, I know what the outcome will be - a pile of tins/jars of Lat blends unsmoked by 2218!!!! I love this pipe and I adore aged FVF..........I have missed them both. Last edited by plugugly; 02-01-2019 at 12:32.